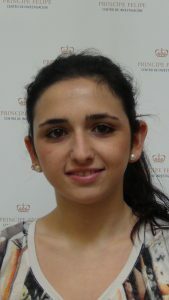 Paula Calderón Biotechnology student from the Universidad Católica of Valencia participates in the GGE Lab. Paula will learn different techniques in transcriptomic analysis and functional genomics by using the R programming language and other tools of bioinformatics software. Some of the analyzes performed are: Study on expression of miRNAs and their funcioanls implications. Interactome isoform level: From transcriptome assembled by “full-lenght” sequencing techniques and quantified by RNA-seq, study the interactions between the different transcripts.